Shadow banking is a new word hardly heard to common people. Shadow banking mostly deals with the big lenders and borrowers. 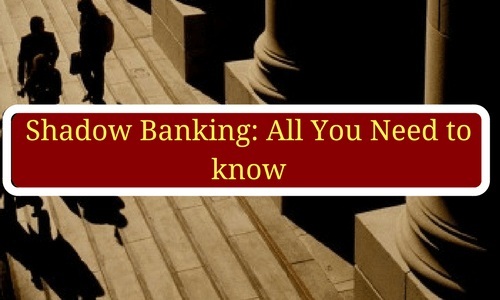 Shadow banking is one type of mediate which helps to make easy procedure between the lenders and borrowers. The term SHADDOW BANKING first came into an existence in 2007. Economist Paul McCulley used it first time at FEDERAL RESERVE BANK OF KANSAS CITY’S ECONOMIC SUMMIT. The term shadow banking is used while a non-banking financial intermediates make provision for the commercial banks. Shadow banking is a comprehensive term to do financial activities among the non-banking financial institutions. In simple language shadow banking is a financial intermediaries involved to facilitate credit in the financial system. It is also called as the unregularly activities done by regular institutions. It works in lesser transparency, rules and regulations as compared to commercial banking. Shadow banks make money by market instruments like debentures, commercial paper. Shadow bank’s liability is not insured. It deals with the high level of risk. Shadow banking make most of their money by being a mediate between the borrowers and lenders. They earn revenue the fees charges for service and interest rates spreads. No need to follow regulations like initial capital requirements. It has come under the increased scrutiny since 2008. This system is prominent worldwide. It is a complex system of investments like Asset-backed securities, derivatives, Credit default swaps and repurchase agreements. Investment funds, mortgage lenders, hedge funds are all deal with shadow banking.